Despite being over a decade into the digital era, Pentax entered the full-frame market with a bang. 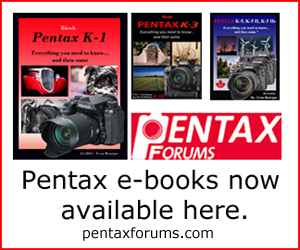 The new Pentax K-1 was the subject of endless discussion well before its release— and now that the camera is available, Pentax shooters across the world rejoice as they can make use of both old and new lenses on the full-frame format. There's much more to the K-1 than the fact that it has the Pentax mount, however. The K-1 is quite a formidable camera in its own right. Its unique imaging features set it apart from the competition, even if other cameras such as the Nikon D810 might have similar core specifications. Beyond this, even at launch it had a rather competitive price tag of $1799 in the US (£1599 in the UK, €1999 in Europe, $2499 in Canada, $2899 in Australia). In terms of image quality, the K-1 pulls ahead of other full-frame DSLRs thanks to its 5-axis sensor-shift Shake Reduction, Pixel Shift super resolution, hardware AA Filter Simulator, and Composition Adjustment. Thanks to these, you can utilize exceptionally slow shutter speeds hand-held, achieve unprecedentedly low noise and high detail in still scenes, put an end to moire without sacrificing everyday sharpness, and turn just about any lens into a shift lens, respectively. All of these capabilities will be covered in detail in this review. Beyond its focus on image quality, the K-1 is designed with the photographer in mind. Small things such as external LED illumination, a multi-directional tilting LCD screen, a monitor brightness setting for harsh sunlight, 3 e-dials, a star tracker, and a fully customizable quick settings menu add up to make this camera as user-friendly as can be. Add to that full weather sealing and a magnesium alloy body that's built like a tank. With so many apparent and less apparent merits, is the Pentax K-1 a home run? Read on as we investigate! This review is based on a production Pentax K-1 running firmware version 1.0. Portions of the review have been updated to reflect feature additions made in firmware version 1.3. 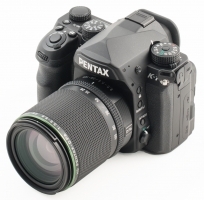 Ready to get your Pentax K-1? Click below to place an order or check current pricing.